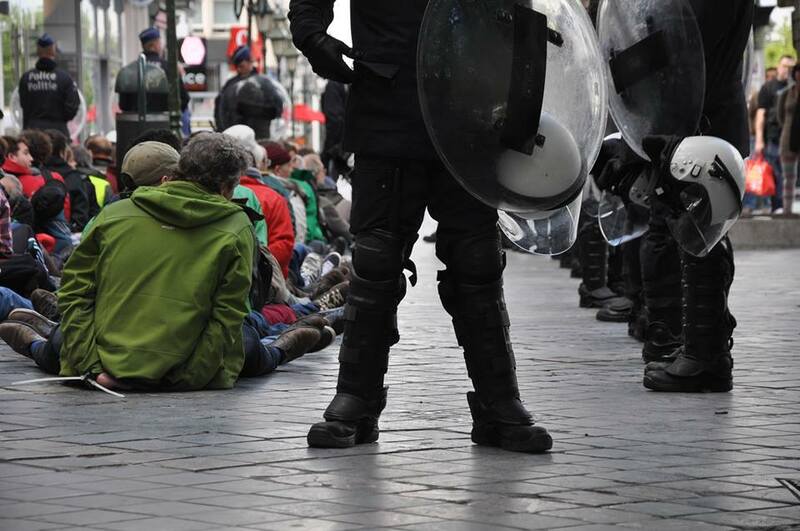 SPECIAL REPORT / 240 people were arrested on Thursday (15 May) around the European Business Summit venue in Brussels during non-violent protests organised by trade unions and citizens’ groups. The protestors had gathered to denounce the budgetary austerity policies in Europe, and the ongoing talks on the Transatlantic Trade and Investment Partnership (TTIP) between the EU and the USA, which they say is being negotiated “in total opacity”. “Today multinationals are inviting political decision makers like the European trade commissioner Karel De Gucht and they are discussing putting more business in Europe,” said Felipe Van Keirsblick, the secretary general of the Belgian trade union for employees, the CNE-CNG. “We don’t want more business in Europe, we want more democracy in Europe and that’s what people want, not what multinationals want,” Van Keirsblick said. What started as a large non-violent protest made up of citizens from all over Europe and from different cultural and professional backgrounds – from farmers to administrative employees and students – was soon reduced to a much smaller group, after the police entered Louise Square, a luxurious shopping district area of Brussels not far from the venue (see footage from the Belgian public broadcaster). For the protesters, it was a “sign that our politicians are bowing down before business interests”. The business summit, which spanned over two days in one of the most prestigious conference venues in Brussels, the Egmont Palace, discussed how to build a more competitive Europe, with panel discussions dedicated to the issues such as banking union, financing innovation and “maintaining citizens’ trust”. Although well-meaning, the summit also revealed a widening gap between what protesters called the “Europe from above” and the “Europe from below”, embodied in the TTIP talks process. Despite projections of growth and job creation the US-EU trade deal would bring, protesters were categorically opposed to it. “When Mexico and the United States twenty years ago started NAFTA, the North American Free Trade Area, they said it would create a million jobs. They’ve lost millions of jobs. Even the figures coming from the European Commission say that very, very little jobs will be created, but people must know that this possible creation of jobs –that never occurs – is only for some little groups, for the richest people. The free trade area between EU and USA will destroy jobs, social protection and environmental rights, especially in the South, the East and for the poor in Europe,” the unions declared. Business interests, they say, erode democracy and threaten the European social model. While protesters were venting their discontent, a panel debate moderated by EURACTIV at the event was dealing precisely with the issue of: How can business maintain citizens’ trust?. A trade union representative, businesswomen and men, and a member of the EU Commission tried to identify the problems. The representative for Business Europe, Renate Hornung-Draus, however insisted that “perception and reality” are not necessarily the same. “Citizens have different facets, they’re workers, they’re investors, and trust is a complex notion, it is not always factual,” she said, pointing at the last Eurobarometer survey on working conditions, in which 77% of respondents said they were satisfied. Hornung-Draus highlighted the importance of corporate social responsibility (CSR) for businesses, big and small, a core issue in managing the reputation of a company. However, she said, most entrepreneurs do not wish to see harmonisation of CSR at European level. “The problem is that people have contradictory aspirations. They want a social enterprise but they also want cheap products. What people want is very nice, but it’s not enough to shape policy and take decisions,” she said. But for Patrick Ischert from the European Trade Union Confederation, the problem lies much deeper. “Remember the food scandals, Rana Plaza, remember the NSA scandal, and the mine tragedy in Turkey. CSR is an opportunity for good businesses and a challenge for bad ones, we need regulation. How can we have citizens trust when lobbyist spend €120 million for the financial sector only? And what is the independence of the Commission towards them,” he asked. Sharma harshly criticised the direction Europe has taken, stressing that it “lacks vision”. “We talk about democracy and human rights but we put trade first, we give our resources to China and we discriminate against 51% of the population, the women,” she added. However the European Commission representative, Paola Testori-Coggi reminded “that Europe is still the place with the greatest democracy and highest standards of living, safety, workers’ protection, access to quality healthcare”. But the arguments failed to convince the trade unionist, who stressed that the economic and financial crisis “undermined the trust of the citizens in general” because labour standards determined by the International Labour Organisation “are not being respected in Europe”, he also lashed out at the REFIT legislation which treats issues like the working time directive as “administrative burden”. For Itschert, despite the high level of wellbeing in Europe, the foundations the union was built on are being dismantled, prompting him to compare today’s EU to Thatcherism. Pascoe Sabido, from the Corporate Europe Observatory, a campaign group, said "Once again we have seen that the priorities of big business are placed above those of Europe's citizens. It's simply not acceptable to arbitrarily arrest peaceful protestors for trying to make their voices heard above the billions of dollars spent by multinational corporations on lobbying. Democracy is truly broken and it doesn't appear like our political leaders are in any hurry to fix it". The European Business Summit 2014 took place Wednesday and Thursday (14-15 May) in Brussels and gathered business leaders, who will seek to present their priorities - looking beyond the crisis and towards a more competitive and better-functioning Europe. The link to RTBF was interesting – does look as though neo-Nazis are not limited to the Ukraine but now wear the uniform of the Bx police – & that org does has form over many years (one of their finest shot dead a woman standing at a bus stop – “by accident” ) so what happened near Louise yesterday fits with a pattern – the neo-nazi police used by business to crush legitimate protest whilst back in the “business summit” apologists from the European Commission mouth platitudes. Such is the society we live in & the Euro elite are surprised that citizens will vote for a bunch of nutters (= anything rather than the usual place holders) in this month’s election? I’m beginning to believe that some right winger if paid or not for risks by it’s own far right wing parties who want to damage the upcoming European elections merely then the TTIP’s. An then the European’s aren’t Mexicans ! We have a lot more to offer in exports a huge more than them ! We have both strong standards ! By the way why today ? 1 week before the elections !! Always a choice for NSDAP’s m*r*ns to destroy if possible what they can! They are well prepared and are able to make fear or even terrorize people if they want. Whatever today my European flag waves now over my garden! Are you aware this treaty is dead on arrival in the US Congress? There is no support for it by lawmakers or the American people. If the truth be known, which it won’t until it’s too late, the US will exploit Europe if this abomination ever comes to fruition. TTIP will come anyway ! Not because the high american/european standards but because of Jobs for both sides despite what you or me am thinking ! Not all people are economists ! Not all lawmaker shares the same opinion.. The U.S. will not exploit us! I think the tricky part of it is that we have to exports more than they do! 240 people were arrested during non-violent protests. Time to break out the Molotov cocktails and bulldozers and escalate the peaceful demonstrations Ukrainian style. Maybe Senator John McCain will come over and lend a supporting hand. Are you from England ? No one hinders the US to adapt to our standards. Europe makes the rules for the world, we are the regulatory leader of the world, our rules are compromises between 28 nations. No need to give the US privileged veto access. TTIP will be an unfavourable deal for the EU and our elites know that. NAFTA lead to job loss, so will TTIP and TISA. We need to empower trade unions and give them more say in the EU and in transatlantic affairs. As long as Europe doesn’t have an from us elected E.U. President as Tony Blair told in 2009 then Europe makes unfortunately not rules for the world! See Putina or Obame THEY rule unfortunately the World ! About TTP or NAFTA! Why worry ? You’re not forced to purchase Americans goods ! It’s on our intersts first to assimilate the U.S. economy BEFORE signing first so European Union can put greater pressure on the U.S. to conform it on the european economy first of all ! But without a President with firm decision it’s impossible that European Union can defend it’s own way !